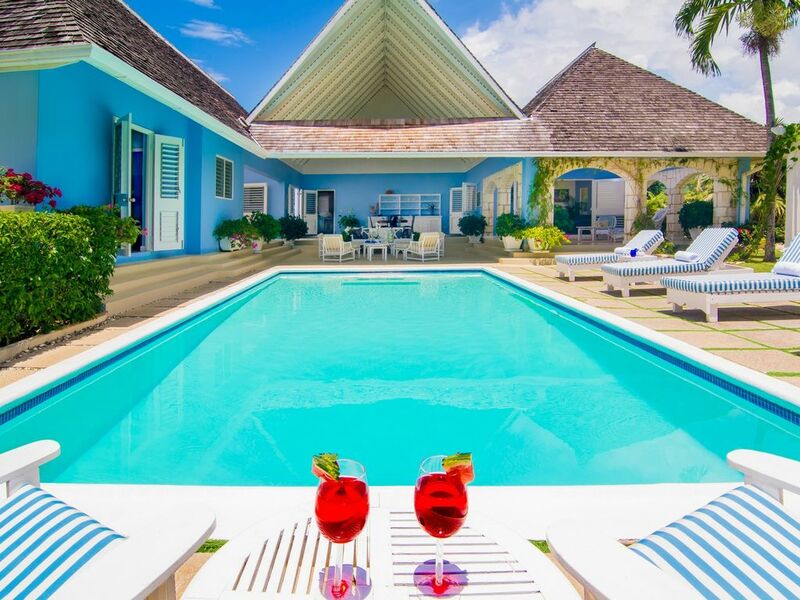 Tryall's only two bedroom estate villa, Little Palm lives large nestled amidst an acre of garden on the 17th fairway and a short walk or quick golf car ride to the beach. Two large bedroom suites, grand entry hall, private pool, indoor/outdoor lounges, and experienced staff, including private chef, are some of the features that ensure guests enjoy a luxurious and memorable holiday. A favourite of honeymooners, this spacious yet intimate hideaway is also the choice for couples, small families or close friends who want privacy and prefer to avoid the fuss of having to coordinate a large group holiday. The villa designed by Jamaica's master builder, Giuseppe Maffesanti, in 1959 as a summer cottage for an English Count, Little Palm is truly a jewel in Tryall's crown. The villa is completely updated with all modern amenities, including solar energy, and is decorated in timeless Caribbean-inspired blue and white décor with furnishings custom made by local artisans especially for the home. Rooms are equipped with flat screen TVs, Cable, ceiling fans and air conditioning.